Indianapolis, IN – The Annex on Tenth, a housing community located in downtown Indianapolis, was awarded Best Student Housing community by the Indiana Apartment Association’s (IAA) 2018 Prodigy Awards on Tuesday October 9, 2018. Located in the heart of Indianapolis The Annex on Tenth is surrounded by schools, shops, restaurants, and parks. 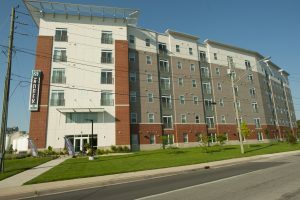 The property is within walking distance from Indiana University Purdue University – Indianapolis. As you approach the building guests are immediately in view of the inviting contemporary clubhouse/leasing office, beautiful landscape, and appealing view of the building and property. Parking located behind the property allows ultimate convenience to residents. Earth tones and a mix of cement siding shake and various color breaks provide a modern look to this outstanding community. The property was designed to create a welcoming feel with the clubhouse at the center of activity for this thriving student centric community. The IAA Prodigy Awards program is held annually to celebrate multifamily housing companies and professionals that have demonstrated excellence in the previous year. Prodigy Awards are presented in conjunction with the Awards of Excellence at the annual President’s Award Dinner, which takes place at the close of the widely attended Midwest Multifamily Exposition and Education conference.